The latest generation of the AURUS large format, fully-automated digital audio mixing console is intended for world-class broadcast, theatre, live sound or recording applications. The design is based on Stage Tec’s Direct Access principle, giving the engineer a entirely familiar control surface with a minimum of multifunctional controls. 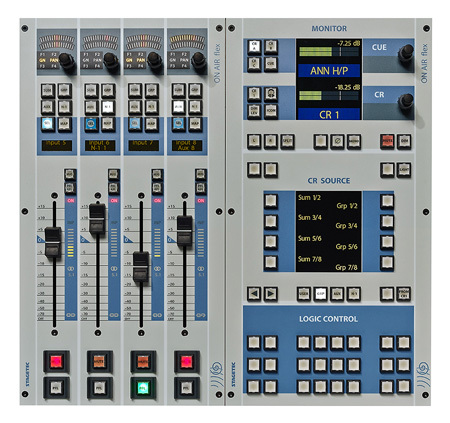 Based on the NEXUS/NEXUS Star router combination, configurations with up to 800 audio channels, 128 mix buses and 96 channel strips/faders are realisable. The distributed, modular I/O system allows for sources and destinations anywhere on or off-site, in almost any audio format. Surround formats up to 7.1 are supported. Snapshot, scene and timecode-based dynamic automation systems with off-line editing, libraries, programmable auto-fade and crossfade. 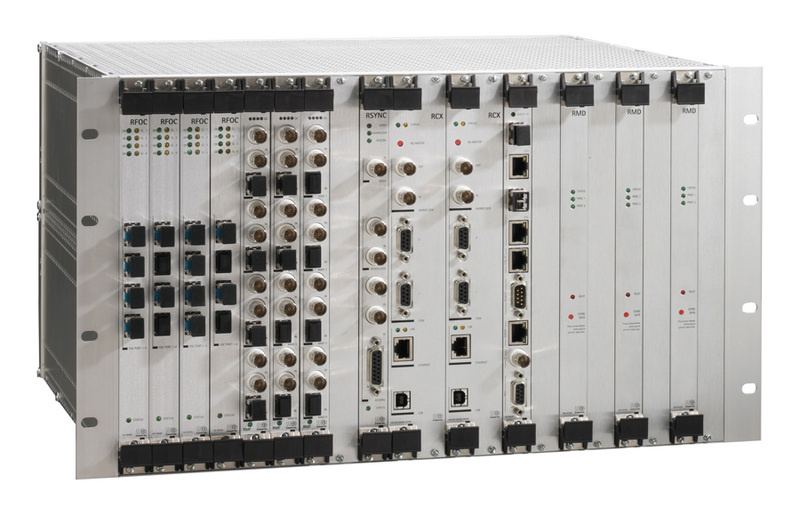 Local analogue I/O for talkback, nearfield monitoring, third-party metering, etc. Large range of programmable user keys – can command Nexus logic functions, GPIO, global functions, etc. User-definable per-channel TFT display can show EQ curve, dynamics characteristic, multichannel panning, routing, etc. See also the entries for NEXUS and NEXUS Star routers for information regarding the central DSP/router core and I/O hardware aspects of the AURUS platinum. The Stage Tec AURUS platinum is a highly-specified digital audio mixing console designed for on-air or off-air production work in TV, theatre and other live environments, or for high-end studio recording. 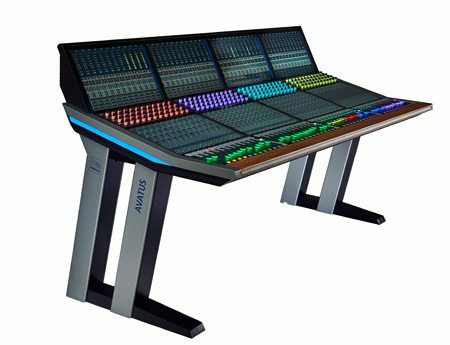 It is an evolution of the AURUS console, and combines the best features of AURUS with recent developments in DSP design and capability. AURUS platinum embodies Stage Tec’s Direct Access principle, in which as many console and system functions as possible are provided with dedicated controls. The control surface layout is thus entirely familiar and logical, while also being highly configurable, to suit individual engineers’ preferences and the requirements of each project. The console’s audio processing and surface control is within a Stage Tec NEXUS Star routing system. All main system audio inputs and outputs are connected via one or more cards in NEXUS Base Devices, which may be located adjacent to the console, elsewhere in the facility, or many kilometres away. Fibre links (dual redundant if required) connect these to the NEXUS Star central router unit which includes the system’s DSP; the NEXUS Star is also connected via fibre to the AURUS platinum surface. The control surface itself handles no audio other than local signals for talkback, nearfield monitoring, etc. If the facility’s audio system uses a NEXUS system as the main audio backbone router, the mixing console transparently forms part of the system, and has access to any sources or destinations within the facility. NEXUS’s flexibility also permits more than one AURUS platinum control surface to be connected into the system, and thus multiple tasks can be undertaken simultaneously, using the same overall “pool” of I/O resources with no constraints. The modular design of NEXUS racks permits almost total flexibility of I/O configuration. Almost any combination of analogue and digital audio formats may be specified to suit the facility’s infrastructure; multichannel options include MADI, SDI, Dante, AES67 and Ravenna with copper or optical I/O; analogue (mic/line) and digital AES3 connectivity is also readily available. NEXUS frames are fully scalable, and the system is thus future-proofed as further audio formats are introduced. The control surface layout of AURUS platinum has been deliberately designed to be as logical as possible. The console may be specified with 16 to 96 channel strips (in blocks of 8), with full freedom of layout. Selection and assignment of input sources to processing channels and buses to output destinations is through the NEXUS Input and Output Matrixes respectively, controlled from the console’s master section. Channel strips have 8 “layers”, so that a large number of sources may form part of a project, yet be under the control of a relatively manageable number of faders. The layers – which are user-definable – are accessed by a local button on each channel strip, and the currently-selected source indicated by an alphanumeric display next to the fader. Responding to engineers’ comments about the ergonomics of many digital consoles, the multifunctionality of channel controls is kept to a minimum. Each channel strip has 32 switches, and 11 dual-concentric rotary controls – each with two LED fan displays – giving immediate access to 22 variable parameters. Full control over all channel parameters is simultaneously available in the central control area. Audio channels may be freely linked to form stereo pairs or multichannel stems as needed, and controlled by a single strip. Linked controls may range from the entire set of channel parameters to a single control. AURUS platinum may be freely configured to suit the task in hand. The entire console configuration – may be saved as project files for immediate recall. AURUS platinum provides three separate automation systems: snapshot, which allows an entire set of system settings to be stored or recalled; scene, where snapshots are sequenced and manually recalled; and dynamic, which stores changes made to all audio parameters against timecode to 10 mS accuracy. Off-line editing of automation data is provided, which includes programmable autofade and automatic cross-fading between scenes. The meter bridge consists of a large, colour TFT screen for each 8-channel block; the data to be shown on each and its display parameters are under user control. As well as bargraph-style metering of signal levels (most international metering standards are supported), the screens can also show channel data such as EQ curves, group and bus assignments, operation of the dynamics section, surround panning visualisation and I/O port identification. Output bus loudness measurement to EBU R128 is also available as an option. The screen above the master section can also display the NEXUS control pages, giving full control of the system input and output matrixes and all other routing, signalisation and logic functions. Despite the AURUS platinum’s high level of functionality, power consumption is remarkably low and the console has no internal fans. Continuous diagnostics report any component problems on the console main screen and via SNMP; both console control panels and Nexus boards are hot-swappable, with rapid restoration to the last-known configuration. Dual PSUs for all system elements are standard.